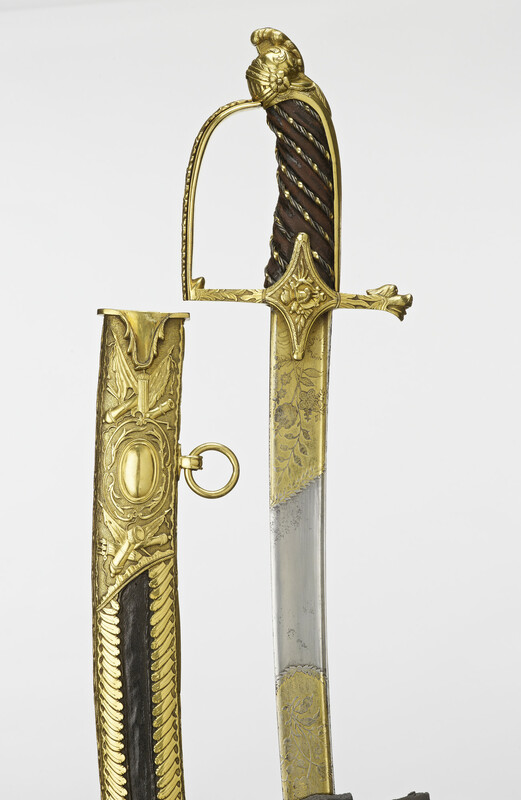 The gilt-brass hilt consists of a guard with a full-length, longitudinally- ridged back plate terminating in a fantastic helmet with a barred visor and a plumed crest. The side iron which is spatulate-ended and of lenticular section, has a strip of cast and chiselled oak foliage applied to its forward edge. The foot, which is of flattened rectangular section, ends in the grotesque head of a lion. Chiselled with long, wavy, stylized foliage on each face of the foot and with military trophies against a matted ground on each face of the quillon-block. The slightly bellied, wooden grip which is alternately ridged and grooved spirally, is covered in dark brown leather and bound in the valleys with silver wire; a twist of two wires each made to look as if it were spirally bound with a thinner wire, all bound at intervals with a concave gilt-brass foil. The strongly curved, single-edged blade which is of T-section, has a bevelled fore edge, a shoulder, a bevelled shampre, with a triangular reinforce at the spine and a clipped point. A gilt panel at the hilt delimited by a diagonal of laurel foliage, is etched in relief with a spray of imaginary flowers on each face; after a plain section is an oval cartouche edged with laurel wreath framing a spray of imaginary flowers; after similar plain sections are a laurel swag tied with a fillet, a spray of imaginary flowers, a spray of lily-of-the-valley, and some star-like flowers. Etched along the spine at the hilt is a laurel spray, and beyond that a series of diamond-shaped panels originally gilt. The wooden scabbard has two gilt-brass mounts, the upper one shaped to represent the conventional two lockets linked by binding-strips, and the lower one to represent the chape and the lower strips, leaving two longitudinal openings which reveal the black fishskin covering the wood in these areas. There are two loose rings in oblate knobs with rectangular mouldings on oval bases. The moulding at the mouth to fit the langets is of rectangular section cast with leaves along its lower edge. The outer faces are embossed in relief and chased in rococo revival taste with military trophies around bright oval bosses framed in wavy stylized foliage, all on a matted ground and all edged with rococo waves. The binding-strips are embossed and engraved with feather-like stylized acanthus tips. The edge of the asymmetrical trail is elaborately cusped and lobed.